Government has revealed that Vice President Constantino Dominic Nyikadzino Chiwenga is in India where he is receiving medical attention. This was revealed by the Deputy Minister of Information, Publicity and Broadcasting Services Energy Mutodi on Sunday evening. "The Hon. Vice President CDN Chiwenga is recovering well from some minor abdominal ailment in Delhi, India." Said Mutodi. "Meanwhile, His Excellency President Emmerson Dambudzo Mnangagwa has secured lucrative deals that will make a difference to the economy and provide jobs to the youths." Zimbabweans who reacted to Mutodi's statement accused him of downplaying the seriousness of the ailment saying no minor abdominal pain may cause one to be transported to India. Recently Zimbabweans in Cape Town, South Africa demonstrated in front of UCT Hospital where the Vice President was rumoured to be admitted at. Commenting on the revelations Tajamuka leader Promise Mkwananzi said," The protests against Vice President Constantino Chiwenga in Cape Town, South Africa have now forced him to travel to India by private jet for treatment. Citizens have power in more ways than they realise. Small things make a big difference." Chiwenga has been suffering from an unknown sickness since November 2017. 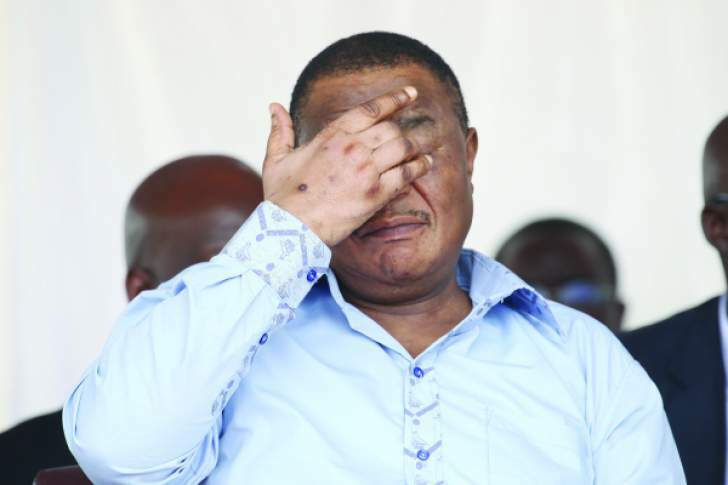 During his sister's funeral in 2018 he revealed that him and his wife Mary Chiwenga started losing pigmentation and swelling in the body after the coup that toppled former President Robert Mugabe. He said he was paying the price for the military intervention which he led. A South African Pastor Alph Lukau prophesied that unless he gets born again and seeks for prayers, the doctors will not be able to cure him.